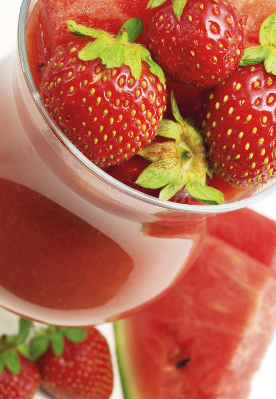 Summer is here and what better way to cool down and hydrate than with this tasty smoothie. Put all the ingredients into a high-powered blender and whizz until smooth. Sally says: "High temperatures can lead to dehydration, a condition that occurs when the body loses more fluid – mainly water – than it takes in. This can cause symptoms such as headaches, nausea, dizziness and even death in severe cases so it is important to drink lots of fluids during the summer months and keep hydrated. "Coconut water is high in electrolytes which help prevent/treat dehydration. These are certain minerals such as calcium, magnesium and potassium that are responsible for directing water and nutrients to the areas where they are needed in the body and for maintaining fluid balance. They also help muscles to relax and contract so they help prevent cramp and muscle soreness post-workout. "Watermelon is one of the most effective fruits against dehydration as it contains over 90 per cent water and is a natural source of electrolytes. Strawberries are also high in water and contain good levels of vitamin C, an antioxidant that helps moisturise and protect our skin from UV rays in hot weather. They are also high in potassium, a natural electrolyte."